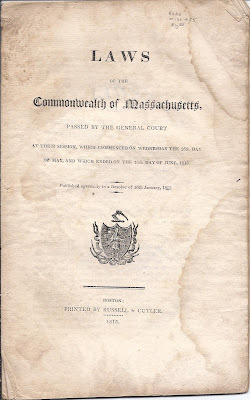 "An Act to establish the boundaries of the town of Belfast, in the county of Hancock", as described in two pages of Laws of the Commonwealth of Massachusetts, Passed by the General Court at Their Session, which Commenced on Wednesday the 26th Day of May, and Which Ended on the 16th Day of June, 1813. Since 1827, Belfast has been located in Waldo County. 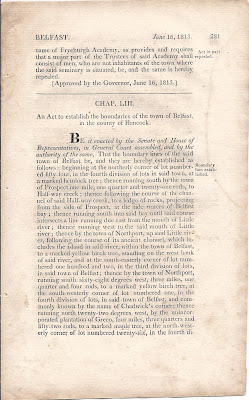 An Act to establish the boundaries of the town of Belfast, in the county of Hancock. 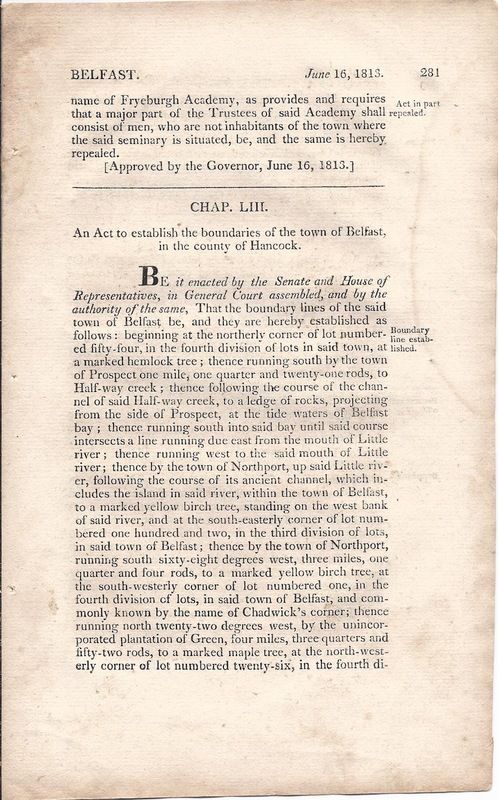 Be it enacted by the Senate and House of Representatives, in General Court assembled, and by the authority of the same, That the boundary lines of the said town of Belfast be, and they are hereby established as follows: beginning at the northerly corner of lot numbered fifty-four, in the fourth division of lots in said town, at a marked hemlock tree; thence running south by the town of Prospect one mile, one quarter and twenty-one rods, to Half-way creek; thence following the course of the channel of said Half-way creek, to a ledge of rocks, projecting from the side of Prospect, at the tide waters of Belfast bay; thence running south into said bay until said course intersects a line running due east from the mouth of Little river; thence running west to the said mouth of Little river; thence by the town of Northport, up said Little river, following the course of its ancient channel, which includes the island in said river, within the town of Belfast, to a marked yellow birch tree, standing on the west bank of said river, and at the south-easterly corner of lot numbered one hundred and two, in the third division of lots, in said town of Belfast; thence by the town of Northport, running south sixty-eight degrees west, three miles, one quarter and four rods, to a marked yellow birch tree, at the south-westerly corner of lot numbered one, in the fourth division of lots, in said town of Belfast, and commonly known by the name of Chadwick's corner; thence running north twenty-two degrees west, by the unincorporated plantation of Green, four miles, three quarters and fifty-two rods, to a marked maple tree, at the north-westerly corner of lot numbered twenty-six, in the fourth division of lots, in said town of Belfast; thence by unincorporated lands running north sixty-eight degrees east, eight miles, one quarter and fifteen rods, to the hemlock tree first mentioned; Provided however, that nothing contained in this act shall be so construed as to affect the claims of individuals to the right of soil within said boundaries. Note: Green Plantation incorporated as the town of Belmont on 5 February 1814.